PokerAlfie is an AI poker player dedicated to playing 6-max poker games on a very high level, capable of challenging even the best human opponents. After six years of hard work and dedication, we at Giletech have managed to produce a unique solution, devising a fully functional, self-thinking artificial intelligence for 6-max poker. 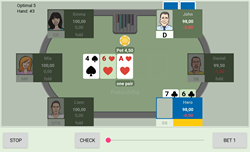 The latest version of PokerAlfie, v2.3, has now been made available on Google Play as well, making it accessible across various types of mobile platforms, including Android, and Windows devices. This offline poker app has been optimized to work with mobile phones, as we have put forth a significant effort towards this goal. PokerAlfie's thinking time has been reduced up to 20 times. Of course, the goal was to decrease the calculation time without affecting the AIs play, and the PokerAlfie managed to surmount this challenging task with great results. The engine behind the AI now acts much faster but still comes up with the best solutions. The decision engine used by the Android version is the same one found on the Windows app, so PokerAlfie will play exactly the same on Android devices under the same settings. The app has been developed as a fully offline poker solution, which means that once you download and install it on your device, it requires no outside resources to play. Capable of making the best decisions even against the best of opponents, PokerAlfie is suitable for everyone, from novices looking to learn the game, to experienced players wanting a challenge. Although the AI hasn’t had a chance to measure up its strength against too many players, PokerAlfie managed to beat Srdjan Pavlovic Nislija at the rate of 5 big blinds per 100 hands over the sample of 5,000 hands. Nislija is one of the best online players from Serbia, with over $1,000,000 in tournament winnings and his all-time high was 394 on the Pocket Fives global leaderboard. Aleksandar Gilezan Giletech CEO: “We are still waiting for the first player to win against PokerAlfie v2.x over the sample of 5,000 hands using Optimal playing style setting in app”. The best part is, PokerAlfie is completely free to download and use without any restrictions. The app is commercial-free as well, meaning there are no interruptions while you play and players can fully focus on their decision-making process. To try this revolutionary poker playing AI, visit PokerAflie official website at http://www.pokeralfie.com or download the app straight from Google Play at https://play.google.com/store/apps/details?id=com.giletech.pokeralfie. Since 2010 the central point of interest of our company has been the development of AI algorithms and solutions for solving problems that cannot be solved using well-known, traditional algorithms or solving problems where it is not possible or appropriate to use big data solutions or algorithms. We’ve been achieving exceptionally good results and breakthroughs trying to solve problems which involve imperfect information.